Reprint. Originally published: London: Doubleday, 2003. Imagine you could go anywhere, meet anyone and do anything. Where would you live? Where would you sleep? Who would be your friends? What games would you play? Go on . . . you choose! 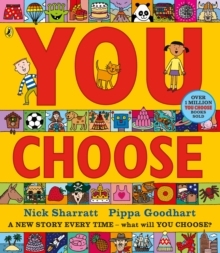 With the help of Nick Sharratt's wonderfully detailed illustrations, Pippa Goodhart explores a whole range of scenarios where choosing is made fun! This is a timeless classic which children will love to return to again and again - and there's something new to find on every read!